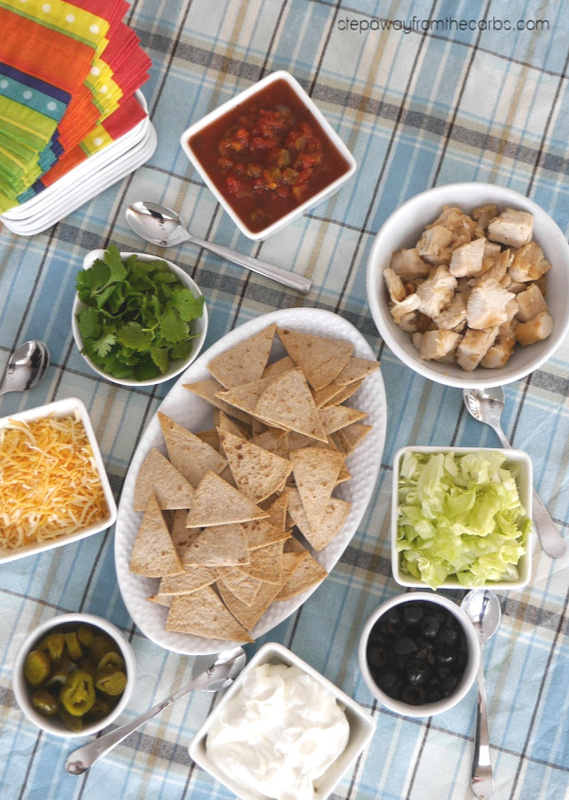 If you want to provide a low carb nacho bar for your guests, here’s how to do it – the easy way! 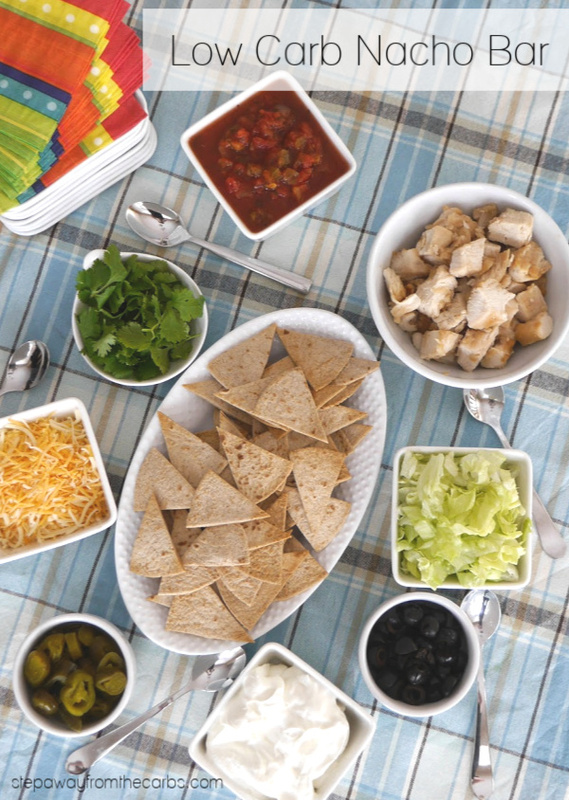 Nachos are just he perfect filling snack to provide at any informal gathering. People can pick and choose their toppings, and eat as much as they like! The key to your nacho bar (or maybe your keto your nacho bar!) is, of course, the tortilla chips. 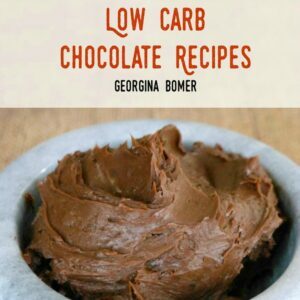 I’ve seen many low carb recipes for making your own from scratch but I’m afraid I just have the time or the inclination! The EASY way is cut some low carb tortillas into wedges, then bake them. 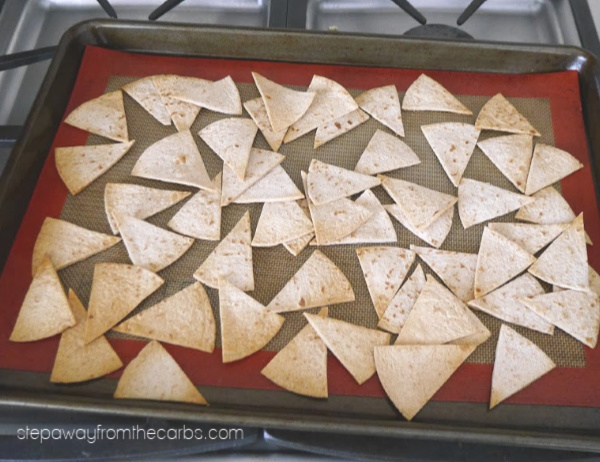 Check out my full recipe on how to make low carb tortilla chips! Note: You can make them in the microwave, but the oven method is way better, especially if you’re making large quantities. 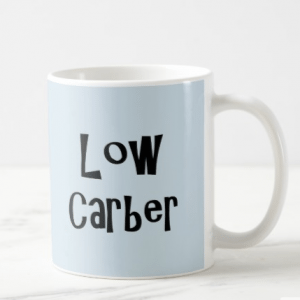 And of course you’ll need some tortillas – and luckily I have a comparison and review of some of the top brands of low carb tortillas for you! My favorite for a while has been the Mission Wholewheat Carb Balance tortillas. They come in a variety of sizes (starting at 3g net carbs per tortilla) and I can easily find them in grocery stores. Once you find a brand that you like, you’ll use them for wraps, quesadillas, tostadas, tacos, and they even feature in my chicken tortilla soup! Seriously, I’d be lost without them! Note: Most low carb tortillas are not gluten free. How many you bake depends on how many people you are serving. But very roughly I think you need two tortillas per person, each cut into six or eight wedges. 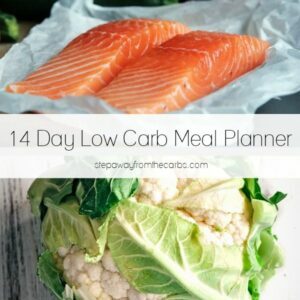 A note about carb count! I haven’t provided a recipe card OR nutritional data for this Nacho Bar. There are just WAY too many variables. 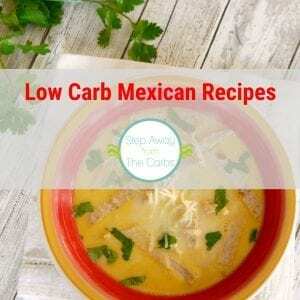 The first starts with the low carb tortillas, and their net carb count. Also, the amount of toppings that you provide and then serve per nacho are very hard to estimate! My best advice is to stick to my suggestions above, and you can’t go far wrong. Although watch out for store-bought salsa: some brands add sugar, so look for the lowest carb count that you can find. What about if you want to prepare this in advance? I’d recommend cutting up the tortillas in advance but waiting until just before serving before baking them – just to make sure they are warm and crisp! Most of the toppings can be placed in serving bowls in advance, which makes it super convenient. If you’re providing chicken or ground beef, you’ll probably want to serve that warm, so you’d need to prepare that while the tortillas are baking. 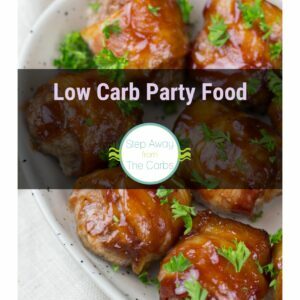 What else would you add to your low carb nacho bar?! ?